Explore by river, one of the least visited countries in Asia in luxury on the new Avalon Myanmar. Meander peacefully through jungle shrouded highlands and sun-seared plains to its mangrove-dotted banks. Learn about the Buddhist religion and visit the remarkable sight of the stunning Shwedagon Pagoda in Yangon, the country's most important religious site. COMPLIMENTARY VIP door-to-door home pick-up service by executive car! Arrive in Yangon, formerly known as Rangoon, the country's largest city and former capital. Transfer to Traders Hotel for 2 nights. This morning take a walking tour of the city's famous and historic landmarks, including the High Court, City Hall, Central Railway Station and Sule Pagoda, built during the time of Buddha. Stop along the way at a local tea shop for a cup of tea or coffee with the locals. After lunch, visit Chaukhtatgyi to see the massive reclining Buddha measuring in at 213 feet. Afterwards, continue to Shwedagon Pagoda, the most important religious site in the country and a national symbol. Here, a truly enchanting scene unfolds as the sun sets on the golden stupa and locals come to pay their respects. Tonight, your welcome dinner is in one of Yangon's best restaurants. This morning, transfer to the airport for your flight to Bhamo. Upon arrival, Explore Bhamo by local trishaw and by foot, then transfer to the port and board the Avalon Myanmar to begin your cruise on the Irrawaddy. This afternoon, get acquainted with the ship and sail through the dramatic Second Defile with its magnificent cliffs reaching down the narrow channel. Join a welcome reception this evening before dinner. This morning, visit a fascinating island village of Kyun Daw, where over 7000 stupas surround the monastery. Take a walking tour for memorable encounters with the villagers. Visit a farmers home to learn about daily life in Myanmar, also visit a local school where they will be a chance to play and interact with the children. Visit a nunnery to present the nuns with food purchased the day before at the market in Bhamo, unlike monks, nuns have to collect and cook their own food. As you sail south this afternoon, may sure to look our for the rare Irrawady dolphin, if you are lucky you may catch a glimpse. This morning, visit a local market, where you will see locals selling fish, meat and fresh produce. Then take a short journey outside the city to an elephant camp in the teak forest. Skilled mahouts will show you how they have worked with elephants for centuries, and you will have the opportunity to ride an elephant through the forest. Later sail to the small village of Tigyang for an afternoon walking tour through its narrow lanes. Visit the pagoda and reclining Buddha on a hilltop with stunning views. This morning, visit the village of Kya Hnyat with its many Buddhist monasteries. Here you can interact with the monks at a local monastery. Each morning they don their distinctive saffron-coloured robes and walk through the streets to collect alms, offerings of food, like cooked rice and curry. This is a truly memorable experience as you present alms to the monks and witness their lunch ritual. Today, take a walking tour through the captivating pottery-making village of Kyuak Myaung. Here you will learn more about the pot-making process and see how they are formed, fired and glazed. Most interesting is the eye-catching 50-gallon variety, often referred to as Martaban or Ali Baba jars in colonial times. These pots could transport large quantities of liquor, fish sauce, peanut oil, and more, and have played an important part of maritime trade through Asia for centuries. This morning take a walking tour through the village of Mingun to see its bronze bell, which is considered as the largest working bell in the world. Spot the famous unfinished pagoda, where construction was abandoned at 160 feet, only a third of the planned height. Later on today sail a short distance to Mandalay. Visit nearby Amarapura, former capital of Myanmar, where you will see the famous U Bein bridge, a three quarter mile long bridge built in 1783 from reclaimed teak wood from the old Royal Palace in Inwa. The bridge is still very much a cornerstone of the community with locals and monks using it daily to cross Lake Taungthaman Lake while fishermen and farmers go about their daily work below. Take a Sampan ride on the lake for memorable views on the sunset behind the iconic bridge. This morning visit a Tapestry and Wood carving workshop to learn more about these cottage industries and see the skilled artisans at work. Then, stop at Mahamuni Pagoda, the most revered shrine in Mandalay, to see its impressive gold-leaf Buddha. Due to the continual application of gold leaves, officials estimate the gold is approximately six inches thick. This afternoon visit Kuthodaw Pagoda and Shwenandaw Monastery, the only remnant of former King Mindon's ''Golden City'' to survive the bombing of World War II. Originally the King's living quarters, the building was moved after his death to its current location and converted into a monastery. Today, the original gilding has faded, but the intricate wood carvings endure, giving you a sense of how extravagant the original teak palace complex was. Lastly, stop at a gold leaf workshop to see how its made. Today, visit Sagaing, an important religious site with countless pagodas dotting the surrounding hillsides. 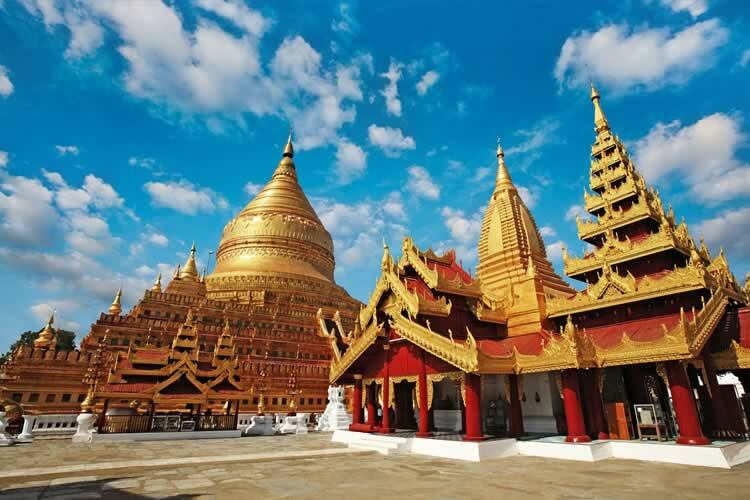 Visit the Kaunghmudaw Pagoda with its golden egg-shaped dome - unique among more traditional pagodas in Myanmar. After its on to Soon U Ponya Shin Pagoda at the top of Sagaing Hill to see stunning views of the Irrawaddy and across to Mandalay. Relax this morning and take in the sights from one of the ships lounges or your suite. This afternoon arrive in Shwe Pyi Thar, a typical village along the Irrawaddy. Watch the locals make palm candy, a sugary and smoky sweet made from the sap of the toddy palm. To harvest the sap, a climber scales the toddy palm and hangs an earthen pot under a slit he cuts the tree. The sap is then cooked in an iron pan over an open wood fire until it thickens and can be formed into small pieces by hand. After dinner there will be a traditional puppet show in one of the ships lounges. Today, explore Bagan, capital of Myanmar from the 9th to 13th centuries. It is estimated that during this time over 13,000 temples, monasteries and pagodas were built in the plains surrounding the city, an area of about 40 square miles. Many of these structures have been lost over time but around 2,300 still stand today, making this one of the world's greatest archaeological sites. Early risers can visit on the temples with a Local Guide to witness sunrise. After breakfast, your morning excursion starts with a visit to a local market selling handicrafts, fabrics and longyis, a versatile sheet of cloth worn around the waist by most local men and women. Then, stop at the ornate Shwezigon Pagoda, one of the country's most important shrines. You will also visit a lacquer workship to learn more about this ancient craft. After lunch, your sightseeing centres on the Bagan Archaeological Zone. Highlights include Ananda, considered by many to be the most beautiful temple, and Dhammayangyi, the best preserved monument left standing. Also stop to see the exquisite and well preserved fresco paintings at Upali Thein and Abeyadana. Your day ends with an oxcart ride to a temple, where you will ascend to the top as the sun sets. Tonight, join your Cruise Director and ship's crew for a farewell reception and special farewell dinner. After breakfast, disembark the ship and transfer to the airport for your flight to Yangon. The rest of the day is at your leisure. Today, transfer to the airport for your return flight to the UK or extend your stay in Inle Lake or Bangkok. Terms and conditions apply. All offers are subject to availability and operators booking conditions. Prices are per person based on two passengers sharing the lead in grade stateroom unless otherwise stated. All discounts have been applied to fares displayed. ^Itinerary operates in the Southbound direction, please call to confirm. Free VIP home pick-up service is available if you live within 100 miles of your departure point. If you live further than 100 miles, you can still take advantage of this service by paying £1.85 per extra mile. Mileage is calculated using the quickest route on Google Maps. All details and pricing are correct at time of publishing. We charge a one-off small £20 booking fee. That’s it - nothing more and no add ons when you pay the balance. E&OE. ABTA P6710.